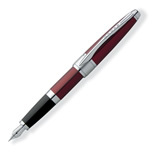 Apogee Titian Red Lacquer fountain pen is pure poetry without writing a word. Perfectly proportioned pen features a rounded, highly polished, spring-loaded clip. It is accented by the wide, satin finish center ring. Fountain pen nib is 18 karat solid gold.